This is the diary kept by Jack Farrow, a 30 year old Sergeant in the 5th Royal Norfolks, who in 1941 was expected to go to India to train troops. However the fortunes of war turned the world upside down and he found himself in the jungles of Malaya fighting for his life, not only against the Japanese Imperial Army but the jungle itself.Having made it back to Singapore in time for the surrender he was taken with many others to the notorious Changi jail where he was put in charge of the grim task of burying his less fortunate comrades. The diary documents the daily life in the camp for nearly four years - highs such as camp concerts and darts matches - lows that brought the camp brutality, starvation and disease. The diary is a remarkable record, written at night and hidden secretly away from the Japanese guards. Such writing would have led to severe punishment if found and the gathering of paper, pens and ink would also have led to reprisals. There are not many 'Changi Boys' left but this book will help us to remember what sacrifices these old soldiers made so that we could have the freedom we enjoy today. 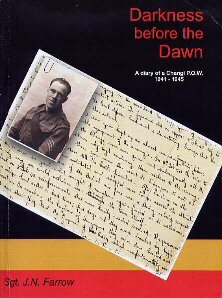 Jack's daughter Francis has edited and assembled her late father's papers into a fascinating account of patience and endurance.The diary entries are cleverly illustrated with Jack Farrow's 'souvenir' documents and against some of the diary entries are notes of the other wartime events that were occurring at the time, often unknown to the prisoners until weeks later. While monsoon rains wash out some of the prisoners' tents at Changi, you find that on the other side of the world the Normandy landings are taking place, producing an eerie contrast and adding a strange poignancy to Jack's account of POW life. Sadly, Jack Farrow died in 1992. During his lifetime he never gave any thought to having his remarkable diaries published. It was a personal tribute to those men he left behind in Changi cemetery ; a way of exorcising their ghosts from his memory. However after his death the document came to the attention of the local museum, who suggested his wife and family approach a publisher. This book is the result.